For the most vocal business owners along 28th Avenue’s commercial strip, the mystery seems to be: why can’t people on bikes just take 30th instead? 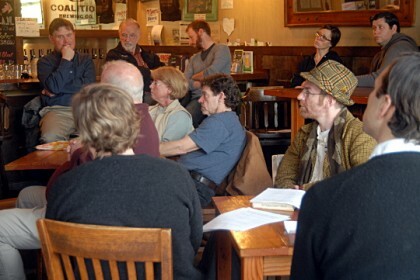 At the city’s first meeting with businesses on the subject Wednesday, Portland Bicycle Coordinator Roger Geller made a data-rich argument that business owners don’t want to push bikes two blocks away from their storefronts. 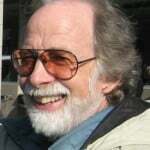 Instead, he argued, the city’s lead proposal for the street would give them a chance to be “the most bike-friendly business district in the most bike-friendly city in America” while increasing the flow of people past their storefronts as more Portlanders shift from cars to bicycles for commercial errands. Improving biking on the street, he said, would be the way to increase the flow of customers to those businesses without as much need for new parking space, which is free in the neighborhood to residents and visitors alike — and increasingly scarce. The tradeoff, he said: biking on the street can’t be improved without removing some of the auto parking and delivery spaces, something many of the business owners feel is essential to their operations. One shared lane and one buffered bike lane is probably the most bike-friendly option the city will accept between I-84 and Stark, Project Manager Rich Newlands said last week. Bill Crane, owner of Holmans Bar and Grill, seemed particularly upset. He said he feels the city wants to perform an experiment on the district that he and his business would suffer from if it goes awry. “Your paycheck still comes, and mine goes away,” he told Geller. The meeting wasn’t a pillorying, and though many who were there seemed skeptical that increasing bike traffic would substitute for the lost car parking, some also said they personally supported biking and appreciate customers on bikes. John Taboada of Navarre Restaurant said he’d lived in Portland for 20 years without even owning a car. Alison Weaver, owner of Meadowlark Preschool, noted that she still doesn’t. But Weaver said she’s unusual: at a house beside hers, two residents share three cars. Parents who patronize her preschool often drop off their children by bicycle in the summer, she said, but they drive there in the winter. “I’m so supportive in so many ways of what you’re talking about,” another business owner told Geller, before adding that her business was too small to take big risks. It seemed to be a common sentiment. 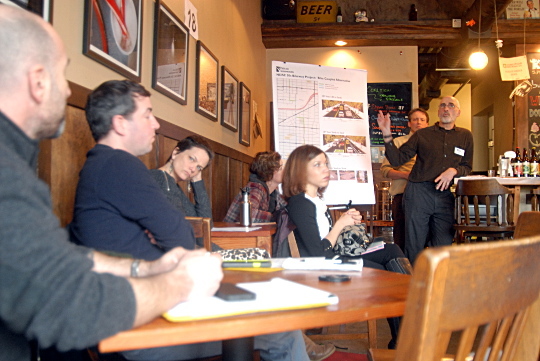 Portland Bicycle Coordinator Roger Geller speaks to 28th Avenue business owners Wednesday. Geller floated the idea that the city could make the changes temporary. One person in the audience replied that businesses wouldn’t last 18 months if things go badly. 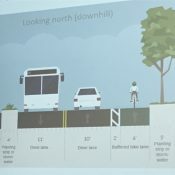 Several attendees of the meeting said 30th Avenue — which the city plans to improve into a neighborhood greenway no matter what — would be a better place to ride a bicycle in any case. Whether or not it improves 28th Avenue for biking, the city plans to also create a low-stress detour on 29th and 30th Avenues. Also representing the city at the meeting were project manager Rich Newlands and his boss, capital program manager Dan Layden. Both struck a noticeably different tone than Geller. Layden said several times that the city’s proposal was only one option and that improving only 30th Avenue was also on the table. Yeah we wouldn’t want business owners with skin the game to have any say now would we? That’s just not very BikePortland! …skin in the game? What game? The automobiles are here to stay game? What about us? Those who bike, who are piping up in the comments to this story? Do we have skin in the game? Are we being lobbied? Asked to participate in straw polls? No one’s asking for business owners to not have any say. They have their say and can reject the proposal. Then if people wish to have their say, they can do it with their wallet. Everyone gets a say. Roads are for transportation not storage. So you are opposed to bike corrals? I think that’s the silliest thing I’ve ever read. Business owners need to see that people arrive at their establishments via all sorts of means. The bike corrals outside Beulahland, and Pambiche that are full to the brim in springtime and summertime are testament to that. The dozens of people getting off the line 19 bus at 28th & Glisan outside Dove Vivi are testament to that. And the people parking on the street are testament to that. I often carry my bike helmet in with me if I go to eat, or get a drink, at establishments on streets like this. Not to look like a nerd, but simply to let the people that work there subtly know that – I arrived by bike, and I have money to give you. I don’t think some businesses realize how many people who patronize their establishments have walked, biked, or taken the bus there. We need to let them know. That’s how you change their mindset. We affect their bottom-line just as much as a motorist does. Maybe even more, since we don’t have to pay for all that gas! Geez, they don’t really make a convincing argument for opening a restaurant. I haven’t been to a single business on that street that I wasn’t specifically intent on visiting. I don’t even know what fills most of that space. I’d be a lot more inclined to do so if I could take my time on that road, but it’s hard to notice any businesses on 28th when you’re trying to stay ahead of cranky auto traffic. Exactly. Those daft idiots don’t even realize that slower traffic would increase patronage, and it’s in their interest to know these things. Bingo. I can’t lie, as a neighbor and someone that frequents businesses on 28th, it’s hard for me to read this article and not think of boycotting the businesses that don’t care about my safety. In the end, I guess it doesn’t matter if their opposition stems from ignorance or not. They are opposing the project, so I have to oppose their business. I think business owners want to be on a street with a lot of “hustle and bustle”, and view streets with more lanes and more traffic as being just that. What they don’t realize is, the more lanes, the more unpleasant the street is, and the more hassle it is as a motorist to park etc. The reason I say this is, I live in a big apt building on NE MLK. We have four lanes of very high-speed traffic outside our building, and two parking lanes, one on each side (so it is essentially, a six-lane highway). Our building is newer, and has storefronts at street level. Most of them, except for a Subway sandwich place, are empty with “For Rent” signs in them, and have been empty, since the building was constructed ten years ago!! I think the reason is, businesses don’t do well on streets like that. The streets are too dirty, too noisy, too busy, too dangerous, and to top it all off, parking is such a hassle on a street that high speed – trying to parallel park into a tiny space when there is four-lanes of high-speed traffic bearing down on you is petrifying to me outside our building – that customers mostly just go elsewhere. If the street was two lanes instead of four, with wider sidewalks and streetscape elements, parking, bikelanes…. you know… the full urban-planning schmear, basically, then I could TOTALLY see businesses renting the spaces in our building. But right now, nobody wants to to open a cafe with outdoor seating etc on freaking six-lane MLK. Holman’s has a parking lot. Have you been in that place? That’s what his business is saying EVERY DAY! For the record, he also owns a different business whose name I didn’t quite catch. This. Holman’s has a parking lot that, unless my memory has totally failed me, is hardly ever full. Not to mention it’s 28th Ave. south of Burnside, which isn’t even really the part of the street that’s particularly congested or difficult to park on; this seems like it’d hit your Laurelhurst Theaters and your Beulahlands and Staccato Gelattos and your Birds Barbershops that are on the narrowest, busiest part of 28th. This really seems like reactionary sour grapes from the owner. And I don’t have anything against Holman’s; I like Holman’s! Except for that time I went in and asked for a Shiner Bock because they have a neon Shiner Bock sign in the window and the bartender looked at me like a crazy person. I’m sensitive to the concerns of business owners on this one, and I’ve never liked the element of the cycling advocacy culture that sees fit to bulldoze the opinions of others. But this seems like an overreaction to me. Even if you take out one lane of parking on 28th Ave., the district will still be easier to park in than, say, NW 23rd Ave. Or Hawthorne. Or Division. And all of them seem to be doing fine. To say nothing of the fact that I’m 100 percent certain slower traffic will drive people to those businesses. Hell, right now there’s so many cars you can barely even freaking see them. North America’s #1 Cycling City ®. 30th? Really? That’s their suggestion? 30th doesn’t even cross the freeway. It’s useless. Nope. And crossing Burnside on it during rush hour is a challenge for a strong and confident cyclist. Stop-gap time there at NE29th/NE 30th crossing Burnside is insane at peak-commute, I agree. It’s a four lane arterial, and without a median island in the middle, you are waiting for all four lanes to clear before you can push off the intersection and pedal across. In the meantime, vehicles are peeling out of the Whole Foods parking lot, and peeling around the corners from NE 28th, meaning, basically, the roadway is never clear to cross. It literally takes me minutes to get across that one stretch of roadway on a bike. Other stretches of Burnside have the same problem. Remember parents at Buckman Elementary lobbying for close to a DECADE to get that pedestrian median island installed last year at E 16th & Burnside so the kids could cross? its pathetic that the posted speed limit for lower burnside is still 35. lowering this to 25 should be an absolute priority for the 20s project. Why any business owner would want to send the customers with the most money to spend (and the most convenient means to stop at their business) two blocks over is beyond me. I was going to ask the same thing. Hasn’t there been other reports (as covered by BP) that have shown, for example, with bike corrals that spending has gone way up at those businesses – both in terms of number of customers and the amount spent per customer? Hasn’t the same been true of business districts that have had their traffic calmed? I ride 28th and that’s the only reason I know any of those businesses at all. And I’ve definitely stopped at many of them. If they were to put the infra on 30th I’d never patronize any of those businesses. Why should I go there if they don’t want me and if it becomes more out of my way? As a business owner told me in response to a similar comment that I made, they don’t give a **** how easy or hard it is for you to get around your neighborhood. They just want money. I know the City wants to sound neutral, but someone needs to “sell” ideas like this if they’re going to get widespread support. Is the City providing the businesses awesome infographics about the research showing retail businesses boomed on case study streets in NYC after protected bikeways were installed? How about the BTA? 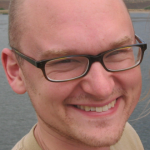 Geller talked in some detail about the PSU research showing that bikers spend more on average. He also shared an anecdote from a bikeway in Austin and talked a lot about his personal shopping habits (he doesn’t tend to patronize businesses on Division or Burnside much because he gets around mostly on a bike and isn’t really familiar with what’s there). Geller also talked about his calculation that rising population in Portland will require 23 new Powell Boulevards worth of capacity lacing through the city unless we reduce auto use over time. I hope to do a follow-up post just about that. I sincerely hope that the city shows some guts (for once) with proposals like this and simply goes NYC on the doubters. Sometimes vision and principle need to trump fear of change. I love that – “Goes NYC” !!!! I’m going to start using that now!!! That’s easy for you to say when your livelihood doesn’t depend on whether this experiment fails or succeeds. For the business owners, their employees and local neighborhood residents they have a lot more to lose than those of you with no skin in the game. That was an Excellent brown bag luch presentation a few months back. 23 Powell Blvds? Where did Geller get his figures? The City of Portland population projections overstate growth by cherry-picking data (they exclude the 2008 recession years- when growth stalled). I know that we will grow- I just get annoyed by politically charged populations numbers. No need to sell it, just do it. Most the commercial property on that stretch is rental. The land owners will find new renters period, ones that will welcome the bike business. The others are more than welcome to relocate to say SE Powell, 122, or 82nd or if they prefer cars over bikes. I don’t recall the city asking me if it was ok to turn my street into a greenway (which I love by the way). Why should they “the businesses” get more of a say than any other property owner? Oh wait, most rent and shouldn’t really have any say, not that even property ownership on a street gives you any right to dictate what the city should do with its property, or what should be done with that property for the greater good of the community. In fact, even a large part of what looks to be my front yard, the city also has an easement in which they can pretty much do what ever they want to do with it, even if I don’t want them to do it. If I’m going to condemn anyone in this whole thing it’s PDOT. Why waste so much time and money on trying to convince people to do what they (PDOT) should, and dare I say- will eventually have to do anyway? PDOT has got better things to do than waste their time in these “stakeholder” meetings. Talk is cheap. And all these meetings do is set the whole project up to failure and half assed compromises which ultimately make no one happy. I see this whole article as damage control. We’ll get 30th, while PDOT sympathetically pats my head and say’s “We tried”….. I know! We shouldn’t have democracy if it means not getting exactly what we want. I think polling shows that there is enormous support for better bike infrastructure. Unfortunately, these decisions are not put to a popular vote. They are negotiated via back-room processes that favor “stake holders” over citizens. Hate to burst your bubble, but this proposal would lose if it was put to a popular vote. Sure plenty of people say they are interested in more bike infrastructure, but it actually becomes real when you take away their travel lanes and parking, and many won’t continue to show that level of support. i guess you missed the poll that was posted here a few days ago where 2/3rds of portlanders supported additional bike infrastructure. And the point is somewhat moot since it was a GENERIC poll with no real prioritization or specifics (which I pointed out a few times in that article’s comments). Again, give them concrete choices like what would happen to this specific street, and you are not going to get 70% support for removing parking an adding bike lane. It sounds like most of the business folks in the room also support additional bike infrastructure — on 30th, not on 28th. I have to agree with you, if this went to a popular vote it would have no chance of passing. If you spend 10 minutes on NE 28th you will see that cars (and their customers) outnumber bikes by at least 5 to 1. The whole process isn’t about democracy, in fact I point out that it’s not a democracy in that PDOT does what they want on my street without any input of the residential “stakeholders” that actually own the property on the street. And PDOT has rigged it since day one that 28th is pretty much off the table but outlining alternatives since the very beginning. Though from the start they really liked the idea of a public right away through the middle of middle school (don’t even get me started on how bad of an idea that is) But ask yourself, Did they plan on alternatives for the non business neighborhoods on the rest of the route – of course not. Because they have no problem strong arming their plans on the residential neighborhoods (mind you I’m in favor of this project – though I think it should be completely shared lane). It just proves that they lack the desire to actually do anything to 28th and would prefer to skirt this section. If they wanted 28th, they’d just do it. Fact is that 28th and many of the other main streets need (not want or would like – but need) to increase traffic volumes to keep up with growth. Much of this growth is being driven with greater density facilities that don’t include parking for cars. And increasing bike share is hands down the easiest, cheapest,safest and best way to do so. Make no mistake PDOT isn’t about democracy, not that I want it to. I just someone there to grow a pair and do something other than the “easy thing”. Often the right thing to do is the toughest thing to do. A couplet on 28th and 29th between Burnside and Glisan would increase overall parking and have room for a buffered bike lane both ways. Impractical but fun plan: put bikeways on 30th, and zone it commercial. When the businesses who stay on 28th see how much more successful all the new places on 30th are, a healthy portion of karma will be served. pretty sure they all think that all of the cars parked out front are all frequenting their establishment, instead of the reality which is that each business really has 1-2 spots in front of them and everybody’s parking 2-3 blocks away anyway. This times 100 million. Of all the zillions of times in the last decade I’ve driven to that neighborhood for a movie or dinner, I can’t recall *ever* parking on 28th. Like, not a single time. I know, right? I’ve gone to brunch at City State Diner with friends before. We all drove in one car, and parked one-block around the corner on NE Couch. And no, the world did not end that morning as a result, you will be astounded to discover. No, I think most folks there would be aware of this — most of them are there all the time, after all. I think their concern is less about the exact location of the parking and more about the quantity of parking in the immediate neighborhood. Two big apartment buildings without on-site parking are going in. That’ll bring them more local customers for sure but it’ll also further strain the supply of free public parking in the area. * will patronize these establishments, since they are only a few blocks away on foot? What I don’t understand is why these businesses (Division Hardware, 28th restaurants) can’t put themselves into a frame of mind where those *not* in cars are appreciated as their customers, their potential customers. What sort of vibe does it send when they take this sort of a position? Is this how they hold onto their dwindling customers? I bet John no-car Taboda was one of the yeses. He told me specifically, when I got his name, that he was undecided, actually. Never know, though. Probably safer that way. Lest he be tarred and feathered. Division hardware has always been perfectly nice about me bringing in my bike. They’ll even watch it for me at the counter. They now have their own lot anyway, so will be less affected by any changes to parking on the street. A couple of racks at the Woostock Ace!!! I don’t think so. The owners and employees are the ones parking out front. They would rather lose business from a few cyclists than park a few blocks away or find other ways to get to work. In November I had a conversation with a manager at one restaurant who (if I recall correctly) said she does her best to get employees to park anywhere except in front of the storefront, so at least one space there will be available for customers. Parking meters on 28th would take care of that nicely (like when I worked on Greenlake in Seattle). The fact that people currently park 2 blocks away suggests that there is not enough parking today to support the existing businesses and residents. If you remove half of the existing spaces where are those people supposed to go? The City’s “solution” to the bike traffic problem is to create an even bigger parking problem for those of us who live and work in the neighborhood. You obviously think of this as a zero sum game. The number of cars is fixed. And the spillover will park in front of my house in my parking spaces. Ack. But I don’t think you are correct in that assumption. Take induced demand, a well-known effect of widening roads or highways. After the widening, more people are observed to drive on them than before, often negating the imagined result. This effect is also runs the other way. You do things to calm a street, invite people biking and walking to use it, and guess what? More patrons of these establishments arrive without a car. Some of this is simple math. Some of it is opportunism. But of course these folks don’t seem to wan that. They’d rather stay in the 20th Century. 9watts is right, it’s not zero sum; and if we always follow this notion that favors making things easiest for people driving, we end up with land use patterns and traffic jams like Houston, TX instead of Portland, OR. The formula just ain’t that simple. If the surrounding 28th neighborhood parking is already contentious, then you can work with the city to try and get residential parking permits (as my Brooklyn neighborhood is doing because of the TriMet HQ parking overflow). That street can use all the help that it can get. Also, La Buca isn’t going to suffer from anything because it already suffers from a boring menu and a lack of flavor. In reality, these people need to see hard data about bicycle-related effects on businesses, but also need to be gently coaxed out of their preconceptions. Do they really know what percent of car traffic on 28th has ever spent money on the street? What percent of the parked cars? How much per car per hour? Then do the same for bikes and foot traffic. the parked cars and awnings and trees pretty much block the places from view north of Burnside. I live close enough to 28th that driving would be really silly, but far enough away that walking is a little bit of a hassle. I would be MUCH more likely to cruise up 28th to grab a drink or a bite to eat if 28th was a nicer place to bike. I’m talking 5-10 extra trips per year at least. I’m sure I’m not alone in this. Vancouver-Williams Deja Vu. When will the city learn that transportation planning a bike facility without seriously considering land use is not acceptable? The ‘Portland Way’ of silo planning by PBOT and PBS need to end. We deserve better. This is an argument for retaining the traffic lanes and parking and bike-car mixing on 28th, but signal-timing, speed-bumping, curb-bumping-out, crosswalk-narrowing, through-traffic-diverting, and otherwise calming – and sharrowing – the heck out of it, until prevailing car speed is 15 mph. When the street becomes that slow, drivers who simply want to get from north to south will learn to take 20th or 39th. 28th will be for purely local traffic and fine for bikes and cars alike. PBOT could be doing these kind of things now. I don’t know why it isn’t when half the sharrows are going to stay there with its suggested configuration! One of the restrictions is that access needs to remain clear for emergency response vehicles. No diverters or typical speed bumps. And semis to the Coke plant. That means periodically sharing a lane with tractor trailers. PBOT: while you are busy “selling” this to the businesses in the area, feel free to take the paint truck out and slap down a few of the nice, big super sharrows, please!! I am afraid that it’s going to take the City doing one of these projects and showing that those businesses do better before any of the business owners on other streets get on board with this type of change. You could even do a straw poll with those same questions which the meeting seemed to conclude…. How far off am I in thinking that a handful of business owners here (or any street) shouldn’t have *much* input on road configurations. PBOT’s mission is to move people safely, not the bottom line of the restaurants and bars on this street. I’m not a business owner so I don’t know the stresses they do but I don’t think their worries about profits should keep 28th from being a safe street for me/everyone to bike and walk down. Yet when it comes to the Max, that’s exactly how it’s sold and how businesses are taxed. These business owners want the same benefits from local transportation options that are being given to other business owners. Can’t have it both ways when selling these proposals. Many of us discussing this situation here are not trying to have it both ways. This habit of linking transportation spending to business prospects over and above safety, pleasant public space, post fossil fuel infrastructure is the problem. Light Rail to me exemplifies this approach; Vision Zero gets at a different prioritization. This comment was with regards to the business owners. They’ve seen other transport projects talk all about opportunities for business, the Max in particular. And as business owners that’s how they think about the world around them. What is the impact to my business. But those discussing it here seem to want to discount business owners completely. Do we want them to go out of business? How does that help anyone to end up with a street/neighborhood without commerce, without jobs? That goes against the whole idea of density and a work/live environment and making trips locally for basic needs. I think we’re watching an exercise of what’s the call “The Backfire Effect”. The more you attempt to alter someone’s deeply held beliefs, with facts, the more you typically just reinforce that person’s original opinions… Honestly, we are all probably guilty of this to some degree because of our deeply held beliefs that bicycles are so awesome, and we don’t want to hear anything otherwise. except that bicycles are awesome. Do you have any evidence that removing a lane of parking for better bike access has a negative effect on business? YOU ARE KILLING ME! HILARIOUS! Could you let us know what 2 were yes votes? That we can just patronize those two businesses and let the other ones drown in their misery. Obviously that’s what they want. No business since they want to divert all customers 2 blocks away. How asinine. We’re human beings, not winter gravel to be swept aside into the gutter and eventually sucked up maybe by Easter. As someone who lived in the Buckman neighborhood 2 blocks away from E Burn & 28th for almost 5 years – that’s a busy, growing district, and to just say “Oh well, let’s just take a huge amount of TRAFFIC and divert it two blocks away because we don’t want to deal with it and we’d rather have the daily near accidents and the sh*tshow that is the nightmare of everyday Restaurant Row.” That’s why they’re barely scraping by in their restaurants and not city planners or civil engineers. My suggestion. Let them do what they do – run a small biz. And PDOT needs to grow some and make some decisions without asking gelato makers, baby clothiers and alcoholics their opinions. I agree. 28th Avenue is a ROAD, and an arterial road at that, not a shop. The entire purpose of an arterial is to move traffic, and the entire purpose specifically of a *PBOT* arterial (so we are told time and time again) is to move traffic *safely*. The purpose of a road is not to pay your store money. PBOT are always banging on about how safety is their number one priority. Well then, show it, and put in bike lanes. I can’t believe the business owners are so anti-bike. Have they never driven up N Williams? That street only has one lane of parking, one bike lane, and the businesses seem to be doing just fine, last time I checked!! THIS. Thank you. As someone who lived on se 28th for 5 year, I wholeheartedly agree. If your restaurant business is failing on “restaurant row 28th,” it ain’t because of bikes or parking! What about my business, and convenience that 28th offers to me? I am not wiggling over to 30th to get from SE to NE Portland. When I was in the Navy, the Naval District Commander,tired of hassles sailors were getting in San Diego, cancelled all shore leave one payday. San Diego took notice. Especially the businesses. There are 5 bike corrals between Glisan and Stark. What if they were taken out of service one weekend? This makes me really sad — I live in the neighborhood, own one car we’re in the process of selling (because we hardly use it), and bike on 28th almost every day. I usually walk to the businesses there. 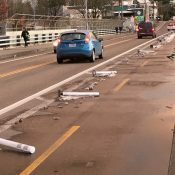 Moreover, having bicycles cross Burnside at 30th would be a death trap without putting in a HAWK signal or similar treatment, which costs ~$250k — way more expensive than re-striping 28t). Putting in a controlled crossing at 30th is part of the plan. So its not working, so you’re going to keep doing the same thing? If the food is good enough, people will walk several blocks to get there. I’ve done it myself. I’m not clear the city has explored all potential methods to mitigate parking loss on 28th. Any 36 ft wide side street could be changed to a one-lane, one-way away from 28th and angled parking placed on one side with existing parallel parking maintained on the other. Angle parking is a more efficient use of space and might be able to offset most of the parking loss on 28th. while many of the side streets are narrower than 36 ft, some notable ones, like Buxton, Hoyt, Randal, Couch and most side streets south of Burnside are 36 ft wide. Ankeny and other bike streets would still need to be 2-way, but how about shifting a few spaces around the corner from 28th in this well connected grid? Why can’t cars just use 30th? It’s just two blocks away and additional stop signs generally help to improve motorized vehicle safety. This was brought up by someone at the meeting, actually, as a way to save the parking spaces. I don’t remember which city employee responded that it would require the city to officially upgrade 30th to a “collector” from a residential street. It’d certainly be opposed by homeowners on the street. This really bothers me & seems problematic of an overall problem PDX has where bike lanes sometimes tend to end randomly & put the bikers in traffic & at risk. What streets are you talking about specifically? I can’t picture them? This issue was brought up a few times at the meetings for the Foster Rd. streetscape. I’m with you. makes no sense to have bike lanes that just end (and many that start up again blocks later). 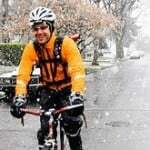 It appears to me that PBOT should consider downplaying the “bike project” aspect of this. What they are doing is simply updating the street design. This is a street design update project, not a “bikeway project”. By having Geller do the dog-and-pony show and presenting this as a “bike project” and detailing the “tradeoffs” (a word with negative connotations), they are setting themselves up for pushback. I’d love to see them go into these type of meetings with a bit more firm strategy and strength about what they would like to do. It’s all in how you frame the problem/solution. I also think the city should consider an economic incentive to sway business owners. Call it an experiment and waive city and county taxes & fees for 18 months. Or give them a development tax credit or something. I totally get why small business owners would be skeptical of any change. Why not offer a little help to smooth the transition over? Like they gave out tax credits when they ripped up neighborhoods to put freeways in?! This is a win-win; high time; no regrets proposal. A slower, more enjoyable, people-centered approach to urban space. Why on earth would we want to offer compensation? And for what exactly? No longer being able to look out on all those parked cars any more? Another thing that didn’t make it into this piece (but will be worth future coverage) was Geller’s offer for the city to spend money marketing the district. He ran out of time to detail this proposal at the meeting. They could sponsor bike share!!!!! Unfortunately Portland is becoming more full of cars than ever. My observation is that less and less people are biking and more people are driving in Portland.We need dedicated bike roads without cars to make it safe. Otherwise riding your bike in Portland is just too Dangerous. And they are all using the bike facilities like bike boulevards, to shave times off their commutes, in droves. Yet, when bicyclists use the arterials in droves, we are being bad. There is no room for new streets, and making existing streets off limits to car travel will never work. While the rate of growth of cycling may have slowed, I think that saying less and less people are cycling is just not true. They don’t have to ban cars altogether. Diverters reduce cut-through traffic and are installed with some regularity (N. Michgan got the last notable batch). They work, for the most part, depending on the design used. Emotion is far more powerful than data. Hence this outcome. 3) car users, who always freak out about both of the above (parking and transport time). Oh, and if there’s time, maybe we’ll listen to bikers? PBOT bends over backward creating plans for “sorta ok” infrastructure changes, that are never seen as the compromises they are by the interest groups above, ultimately leading to a watered down change or no change at all. It goes without saying that approaching infrastructure in this way will make biking stagnate in Portland. Oh, wait, biking is ALREADY stagnating in Portland…. This is a prime example of people acting out of emotion rather than reason. Data show that people riding bikes spend more money overall at local business than people who drive cars. It’s easy to see why – it’s much easier to stop at a business on a bike than looking for car parking in a parking-scarce area. Plus, you can see more places from the saddle than the car seat. Data also shows that people riding bikes are a smaller percentage of the total. Parking is generally considered a major plus for brick n’ mortar businesses, even bike shops. There is a very real chance that some of these businesses will fare better, some will likely do worse. The business owners concerns are rational for them. 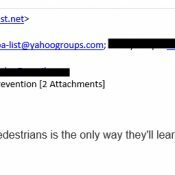 This is about prioritizing the safety of many street users even if it may subtract from revenues for a handful businesses. That seems appropriate to me even if it is sad for them. Let’s be real here, for most of these businesses we’re talking about a couple of parking spaces. People wanting to come to their business are very rarely going to just give up because they can’t find a spot on 28th. As others have mentioned you rarely find a spot on 28th so you go there EXPECTING to park in the neighborhood. The City caves on everything. In an effort to appease everyone, we get mediocre. I ***used*** to go to Holmans. I’ll scratch that off my list. c) developing teleportation skills to cross the fictional magical bike-crossing that apparently exists for bicyclists at 30th across the I-84 chasm. I think every business owner should go drive on 30th for the next month, and see how much THEY like crossing six major intersections with no light, waiting up to several minutes at every single intersection to cross at peak commute times, and, of course, figuring out how to levitate their vehicle across I-84 at 30th, since last time I checked, there was no road there! While not ideal… what about sharrows both directions.. take the lane, slow the traffic, leave the parking on both sides? Is that much different from sharrows on one side of the street? Diverters and advisory bike lanes. More seriously, she probably wouldn’t seek compliance from everyone who has some nebulous stake in the street before making changes. After all, that’s not the process that was used to rethink Times and Herald Squares, or redesign Columbus, 1st, 2nd, 8th, and 9th Avenues. Agreed. It almost seems like the small meeting with majority opposition plays out as negative initial PR, and the contention will grow from there. Starting with a wider neighborhood survey to (hopefully) get supporting data and then presenting that would’ve set the supportive context so the business owners wouldn’t appear to have the majority voice. If this becomes some contentious fight like the NY Prospect Park West debacle, the above comments about kids biking to school deserve the same media recognition as business owners voicing opposition due to nebulous financial fears. Lastly, as a somewhat recent transplant, the zig-zag routes (as 30th would be) are confusing and feel like a compromise that almost always favors car traffic. How many parking spaces is the City looking to lose exactly by removing one side of curbside parking? The number I saw reported was 108. I am disappointed at the business owner response to this plan. I am not a traffic engineer, but as a customer of lots of local businesses, I can say I have NEVER made a shopping decision based on the availability of parking. If I want to eat somewhere, I eat there. If a shop has something I need, I go there. How does a business owner not understand that the more slowly the public passes their door, the more likely they are to get noticed? My wife has a booth we take to craft shows, and I have solid data that we sell more of our wares when we are located in a busier (which means slower walking shoppers) area. I ride 28th everyday–super early with two kids on my bike (school drop off)–between stark and Ankeny and I can tell you it is the most stressful 4 blocks of my 7 mile ride. Isn’t it just as likely that instead of barely paying bills, this street change will have those owners raking it in? Fear is no place to make decisions from and the city should do what makes sense for the whole city. PBOT can change the posted speed on any street that has at least 50% business uses in 600 ft on one side, or 100% in 300 ft on both sides, to a 20 mph business zone without asking permission from ODOT. ORS 801.170 defines a ‘Business District’ and 811.105 lists statutory speed limits. Slower speed limits could help with the safety of mixed modes. …We’ll take money for the 50s project as well as the Foster project. Close in people don’t even ride. The pitch SHOULD NOT be about bikes. It needs to be about the local business’s on 28th and the challenges that THEY face. And the challenges that they have is competition from NW 23rd, Mississippi Ave, Alberta, Belmont, Hawthorne, Sellwood and others. So the pitch should be that this is a unique opportunity to trump those other commercial districts by offering the most unique dining and shopping streetscape experience. Collectively if they endorse a plan that creates a unique street vibe it will be a differentiation from other similar areas. And apparently some of them are “struggling” so this is a perfect opportunity for them to change the game. And the beauty is that they don’t have to pay a dime to do it. If PBOT and Portlanders truly put the safety and access of all right of way users ahead of maximized mobility for the dominant mode, the consumers of the public rights of way would be demanding change before PBOT got around to it. The city can build this on 28th or not, and plenty of cyclists will still use the street, it’s a public street with multiple benefits for cyclists whether there is any cycling-specific infrastructure or not. And, what if organized groups of cyclist began using travel lanes at a speed they feel is safe and comfortable, say 15 mph on SE 28th. How soon might motorists demand separation (which can only be achieved with parking removal)? I live just off of 28th, and very frequently walk or bike to many establishments there, including, formerly, La Buca and Holmans. I would love to know what other businesses voted “No”, so that I can stop patronizing their establishments. I know Tapalaya gives Happy Hour all night on a certain night to anyone who bikes in. I’ll assume they were a “Yes” vote…? Doesn’t Holman’s have it’s own parking lot???? Sorry didn’t read all the above comments. I wonder how many of the businesses aren’t anti-bike per se, but rather just thought that the *specific* plans PBOT are proposing are awful. I would like to see one lane of parking removed, and a bike-lane each direction striped. One cycletrack heading northbound, and no facilities whatsoever heading southbound (I don’t count a painted sharrow as a “facility”, I’m sorry) for cyclists is nuts, not to mention inequitable. The argument that 18 months will sink a business is bunk anyway. I guess if I were a business owner, I would be a LITTLE skeptic simply because changes like this rock the boat. But entire street closures last 18 months and businesses that are worth a hoot stay open because people will find a way to go there, if the business is worth going to. A short experiment time would affect the bottom line very little, even if the experiment turned out to be an utter failure. The city should go forward with the changes on 28th, with a shorter trial period simply to show business owners of the potential benefits. As a patron of the NE 28th corridor business between NE & SE 28th Avenue, I wanted to express my concern regarding the 20’s bikeway project. First and to be noted, I am a proponent of bicycle commuting and the benefit it has on our environment as well as the sustainable livability in our community. I have always been “pro cyclist” in this regard and although I work from a home office now, I have commuted to work by bicycle in past jobs. 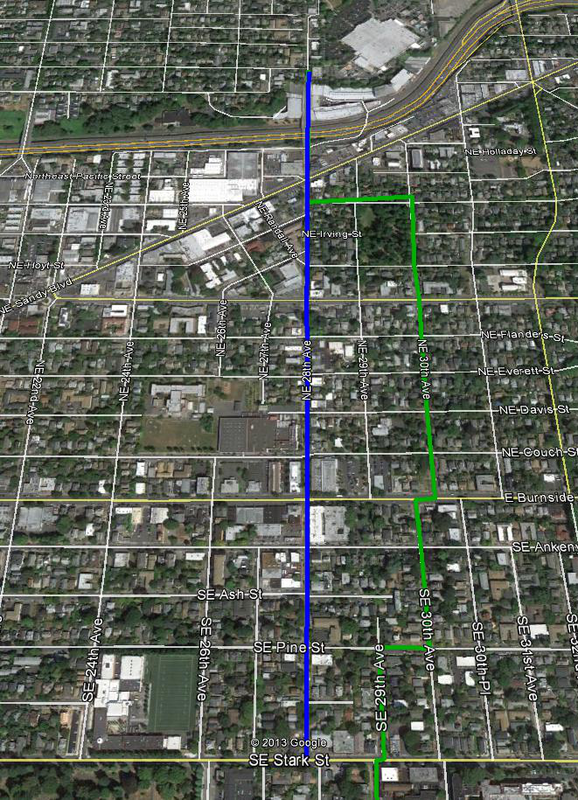 However, I have to object to the 20’s Bikeway Project in the vicinity between NE Sandy and SE Stark streets. The logic and reasoning being that there are a multitude of small, locally owned businesses along this corridor that depend on parking for their businesses to thrive. Their customer demographic is dependent upon auto parking. Taking parking away along this corridor could cost the business owners hundreds of thousands of dollars in lost revenue. You can’t possibly argue that you will take your families to these businesses on your bike to have dinner, lunch, etc. You will not be doing that and they will see a substantial decrease in their sales with the result being closure of business. How is this not obvious? This said and for example, if you were to take away street parking on Hawthorne, Belmont or the 23rd area, those businesses would be crushed. Parking is already an issue for those neighborhoods as it is in the corridor on 28th Avenue. I believe it’s easy to see that if you take away parking in this corridor, most of the businesses would severely suffer and likely go out of business leaving a baron wasteland of “for rent” properties in it’s wake. The domino effect would then incur and you would increase the un-employment rate in Portland to an all time low for the service industry employees as well as those that are employed by the small, retail shops in the corridor. These are people’s livelihoods we are talking about. People with families to support. I implore you to look at the larger picture of our city in this instance and find an alternative solution for the North to South bikeway. Is it really worth having hundreds of people lose their jobs and loyal, small Portland businesses go down because the cyclists can’t veer a few blocks off to get to their destination? I have always been okay with taking the bike lanes through neighborhoods to get to my destination. Why is this such an issue for other commuters? It doesn’t seem logical OR the ethical choice for our city. We are a community built on the premise that we support small businesses but this project is not supporting that ideology and will be detrimental to them if the bikeway project goes through in this area. Except the majority of people visiting businesses on this stretch aren’t currently parking on 28th. Yet they’re still going to the businesses. Most of the businesses would go out of businesses, from taking away a not that big number of spots from ONE SIDE OF THE STREET? @Lola: Unfortunately, your arguments are very far from the truth. If reduced parking was actually a death sentence for local businesses, then how is that local businesses are thriving in areas like downtown, the pearl, NW, and others? And if parking was so essential to business survival, then why did 28th Ave businesses champion the idea of converting car parking to bicycle parking with the on-street bike corrals? It is absolutely ridiculous to say that removal of *some* car parking from 28th Ave will cause local businesses to wither and a spike in Portland’s unemployment. Here is the part I think you should really try to equate: what is the actual value lost in the removal of parking spaces from 28th Ave? How many customers will actually choose not to patronize a business solely for this reason? Or how many fewer visits will they make? Now, compare that with increased value of being the first commercial corridor in the city to attract bicycling on this scale. Compare that to the marketing value of thousands of more impressions as bicycle riders utilize this street instead of the side streets. I would argue that the 20s Bikeway project is actually going to bring net value to these properties and businesses. If you really want to support local business and stave off unemployment, then you should be supporting this project. Side note: Like many people, I use SE Ankeny on a daily basis for my commute. As a result, I have almost no idea what businesses are located on E Burnside between 12th and 32nd ave. I do, however, know 90% of the businesses on E Burnside between the bridge and 12th Ave because of the bicycle lane there. Whether I’m riding my bike to grab a beer, or taking my family out for dinner in the car, the businesses I see most frequently are what come to mind when making a decision about where to spend my money. The city of Portland’s own data show’s that nearly 20% of trips on the inner east side of Portland are by bike. Why wouldn’t a business owner want those trips to go by their business? To turn that away seems like a strategy for failure. For the record, I am not a fan of many small business owners. They often compensate their employees very poorly and frequently have an entitled libertarian bent. I would be happy to see these types of businesses shuttered or replaced by businesses (large or small) that share my values. As for empty store spaces, please contrast Williams versus Hawthorne (where short-sighted small business owners vetoed bike lanes in the late 90s). Additionally, I don’t believe any of these businesses are “anti-bike”. The issue is their main customer demographic. They want to keep all their customers happy whether they are cyclists or “auto” customers. It just so happens they have a major demographic of people who do not go by bike. There’s got to be some reasoning here and the business owners are not the “bad” guys. They are just trying to stay in business for YOU. The people who go to their establishments. Are any of you on this blog small business owners on 28th? Anywhere else? I would guess not from the communication here. I am not either but I see both sides of the issue. Some things are not black and white so you have to consider all the perspectives. I hear their objections, and hints at their thinking, and am not persuaded that *that* side of the issue has very much merit. I’m not saying the business owners who voted no-way-no-how don’t genuinely believe that the sky will fall if some parking is removed. What I’m saying (and Doug and many others here are saying) is, what if they’re just plain wrong in their expectation of how this would shake out for them if we went with the calmed, bikey version of 28th? If this were being run well someone (Geller, Novick, Treat, Dill?) would step up and say this. Keep in mind that merchants that rent in super malls are paying a premuim to NOT have cars parked near their store fronts. This should be looked at as a real opportunity for 28th street at no cost. Just my 2 cents. @Lola. It is not at all clear that removing parking on one side of 28th would have the dire effects you cite. Many people arriving by car to the area end up parking on side streets instead of 28th anyway. Is there any research on how far patrons will walk to a restaurant? To another type of business? This just seems to be conjecture. All the parking on the side streets remains, and as someone suggested, by making some of those side streets one-way, the city could put diagonal parking on them, increasing the number of spaces. If a business district is desirable, car drivers & passengers will walk further. They seem to walk several blocks to patronize businesses on NW 23rd. The comments of one business owner could be taken to imply that a lot of the spaces along 28th are actually filled by business owners and employees (but not theirs)! You get there early in the morning, and you have a spot for the day. Time limits on parking (and meters to help enforce that?) could reduce that bad-for-business behavior. As you mention people already park on the side streets because there is not enough parking on 28th. Where are the 100 cars going to go once they are kicked off of 28th Ave? Oh that right in front of my house. 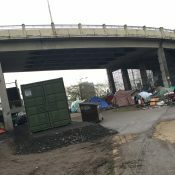 You all seem to feel that removing cars off of 28th is a no lose proposition, but I have to tell you for those of us who live here there is plenty to lose. You are correct: removing parking from 28th will push more vehicles into the neighborhood. But so will more successful businesses on 28th that generate more visitors. So will the growing number of high-density developments in the neighborhood. The reality is that parking in front of your house is not going to be as convenient in the future, regardless of what you do. Consider it a minor downside of having your property dramatically increase in value. Have you considered tearing down your house and building a parking garage? Just kidding! Does anyone have a legitimate number of spots this would be losing, I think 100 seems like quite an over estimation. This is the price neighbors will pay for being in a desirable and high traffic area. You get trade offs though in increased property values and great amenities close by. Yes, it’s about 100 spaces that’d be removed. I’m hoping to figure out soon exactly how big a share this is of the parking supply in that neighborhood. So 100 over a 15-16 block distance (about 0.9 miles)? Thanks for the reply. I live on 28th and received a flyer for this meeting. It was mildly offensive to be invite to a meeting about the future of the neighborhood at 1:30 pm on a work day not to mention the overall tone of the flier and the lack of identification of who put it there. They asked “where will the residents who live on 28th Park?” Well we park our 2 bikes in our house and car on the street in front of our home thanks very much. No mention of a business group or neighborhood association. My household of 2 shares 1 car and two bikes. We moved to this location because we could walk, ride our bike and access multiple bus lines as our primary mode of transportation. Also we’ve been to nearly every restaurant on 28th, to know most of them are opposed to improving the street is disheartening. There’s plenty of parking in the neighborhood off 28th. The real snarls in traffic come from people double parking outside kens and bamboo to let people off to stand in line. I really love living in this neighborhood and I think the street could stand to be improved for the safety of all type of transportation. Also if your business has a parking lot you don’t get to complain. Wasn’t this meeting supposed to be for the business owners exclusively? I’m not a business owner, I just live on the street and I received a flier in my door. This was targeted just to business owners. More town halls for the proposal are coming soon, very well-publicized. Would be interesting to use this district as a test area to collect data. Why not have all the businesses survey their customers to see how they got there? We live close by and often walk and aren’t decked out in bike gear. I think they would be surprised to see the mode split for drivers isn’t as high as they believe. Jonathan is spot on…this is and should be pursued as streetscape redesign to accommodate changes in transportation modes. Why not start with bold Sharrows in both directions, a 20 mph speed limit (common in commercial districts), lots of striped crosswalks, and strong signage at Sandy and Stark that motorists must yield to pedestrians and bicyclists with alternate routes (20th, Cesar Chavez) indicated. Retain all parking, as it provides a needed buffer between pedestrians and vehicles and also helps calm a street…as folks back in to slots. Put parking meters on the street with funds going to subsidize employee transit passes and cover the costs of improved bicycle and pedestrian facilities. Love this but with a lower speed limit. Yes, 15 mph would be much better. I live on 28th and I’m too afraid to ride my bike on my own street. I see bike accidents happen right in front of my living room windows at least monthly. There isn’t that much parking on one side of the street anyway! Oh your business is going to lose 4 parking spots? Big deal. There are side streets everywhere. We’re talking about HUMAN LIVES here. and you’re talking about parking for your restaurant.